Orthognathic surgery is sometimes called "Surgical Orthodontics" because, just as an orthodontist repositions teeth, an oral and maxillofacial surgeon uses orthognathic surgery to reposition one or both jaws. Just as "orthodontics” means "straight teeth," "orthognathic" means "straight jaws." In fact, because moving the jaws also moves the teeth, orthognathic surgery is usually performed in conjunction with orthodontics so that the teeth are in proper position after surgery. The objective of orthognathic surgery is the correction of a wide range of minor and major facial and jaw irregularities, and benefits include an improved ability to chew, speak and breathe. People who can potentially benefit from orthognathic surgery include those with an improper bite and those with jaws that are positioned incorrectly. Jaw growth is a slow and gradual process, and in some instances, the upper and lower jaws may grow at different rates. The result can be a host of problems that can affect chewing function, speech, long-term oral health, and appearance. Injury to the jaw and birth defects can also affect jaw alignment. While Orthodontics alone can correct many "bite" problems if only the teeth are involved, orthognathic surgery may be required if the jaws also need repositioning. Based on the results of your examination, consultations and other diagnostic procedures, you can decide on the course of treatment that is best for you. Depending on the extent of your problem, orthodontic treatment alone may be sufficient, or orthognathic surgery may be indicated. Surgery can range from minor movement of a single part of your dental arch to the repositioning of both jaws. During the pre-treatment consultation process, feel free to ask any questions that you have regarding your treatment. When you are fully informed about the aspects of your case, you and your dental team will make the decision to proceed with treatment together. Orthognathic surgery requires a team approach among the orthodontist, the oral and maxillofacial surgeon and the restorative dentist to assure that a satisfactory result is achieved. Some people may consider having cosmetic procedures to enhance their new appearance, such as surgery on the eyes, nose, chin or neck. You may wish to discuss these options with your surgeon including if and when these procedures should be performed. Because your teeth are being moved into a position that will be correct after surgery, you may think that your bite is getting worse rather than better during this phase of treatment. However, when the oral and maxillofacial surgeon realigns your jaws into proper alignment during orthognathic surgery the teeth will be moved into proper position. After surgery final orthodontic tooth movement is usually necessary to “fine-tune" your bite. Following removal of your braces, you may be required to wear a retainer. If you still have your wisdom teeth or your teeth are too crowded, it may be necessary to remove certain teeth prior to beginning orthodontic treatment in order to make space for proper tooth movement. As your pre-surgical orthodontic treatment nears completion, the oral and maxillofacial surgeon will make final preparations for the surgical procedure. Additional records will be taken, similar to the previous ones. Your surgeon may use new x-rays and models of your teeth and jaws to “simulate” surgery in order to finalize the surgical movements of your jaws and anticipate the results of the procedure. From these models a plastic bite wafer can be made to serve as a guide for proper tooth realignment. When the team determines that your teeth are in the correct pre-surgical position, surgery will be scheduled. Preparing for Orthognathic Surgery Orthognathic surgery is performed in a hospital or ambulatory surgical center under general anesthesia. Prior to surgery you will have a physical examination to ensure that you are in good overall health. You may be advised to donate blood in the event you need a transfusion during surgery Certain dietary supplements and exercise may be prescribed to achieve optimum health, so that healing after surgery will be as rapid and uneventful as possible. Any required lab tests will also be done prior to surgery. In most cases, you will check into the hospital or ambulatory surgical center on the day of your surgery. Your anesthesiologist will discuss the general anesthetic procedure to be used and answer any questions you may have. In addition to the use of general anesthesia, which puts you to sleep during surgery, you will be receiving intravenous fluids and medication to prevent dehydration and infection, and to minimize swelling and pain. It is very important that you adhere to any medication schedule or diet prescribed by your surgeon. You may receive pre-operative medications to reduce normal pre-surgical anxiety. The orthognathic surgical procedures last anywhere from one to several hours, depending on the amount and type of surgery needed. ln lower jaw surgery the rear portion of the jawbone behind the teeth is separated and the tooth-bearing portion is moved forward or backward, as appropriate. In upper jaw surgery the jaw can be repositioned forward or backward, or the jaw can be raised or lowered. Certain movements may require the jaws to be separated into several parts, with bone added or removed to achieve the proper alignment and stability. Other facial bones that contribute to the imbalance may also be repositioned, augmented, or reduced in size. Immediately following surgery you will be moved to the recovery room until the general anesthesia has worn off. Your family may not be allowed in the recovery room, but they should be able to visit you shortly thereafter. An intravenous apparatus attached to your arm can provide required medications and nutrients until you are able to take sufficient liquids by mouth. Medications may be administered to control post-surgical discomfort or pain. The length of stay can be one or more days. You can expect temporary swelling, especially of the lips and cheeks, and perhaps bruising, but this is a normal healing response and should disappear over time. For the first few days after surgery you may experience nasal congestion or sore throat due to the nasal tubes used for anesthesia. Post-operative discomfort is usually not significant and can be controlled with medications. To aid in healing, your jaws may be prevented from moving with the use of fixation appliances. In many cases the jaw sections are held together during the healing period by small screws placed by the surgeon. In other cases wires are used to hold the bones together and keep the jaws from moving. While your jaws are fixed and healing, you may consume a liquid diet. During the first week after surgery your dietary intake is very important, and you may be advised to supplement your diet with liquid vitamins and minerals. A blender can be used to liquefy almost any food to provide a balanced diet. Smoking is highly discouraged as it can retard the healing process. Strenuous activities should be avoided during the first postoperative weeks. During healing when you leave the hospital or surgical facility you should be able to return to work or school as soon as you feel like it, often within two weeks for most people. Your appearance may have changed somewhat due to the repositioning of your jaws and associated swelling, so you should be prepared for signs of surprise from your family and friends. It won’t take long for them to adjust to the “new” you. You will see the oral and maxillofacial surgeon and the orthodontist for regular evaluation visits, and it is very important that you keep these appointments. The surgeon will monitor your healing, and at the appropriate time, remove fixation devices if they were used. The initial healing phase will take approximately 6 weeks, but completion of the healing process will take 9 to 12 months. During the entire healing phase it is critical that you practice the best possible oral hygiene. Your surgeon and orthodontist can assist you in this area, and may recommend the use of some special oral care devices. The orthodontist will usually begin the post-surgical phase of orthodontic treatment 4 to 8 weeks after surgery to "fine tune” your bite. In most cases braces are removed within 6 to 12 months following surgery. Follow-up care after your orthognathic surgery and related orthodontic treatment are completed, your surgeon and orthodontist will want to see you periodically to monitor you and make sure your teeth and jaws are staying properly aligned. You should maintain your oral health and visit your family dentist regularly, and have any other needed dental work completed. Orthognathic surgery moves your teeth and jaws into a new position that is more balanced, functional and healthy. Not only should you be able to bite and chew better than ever before, but your appearance and speech may be enhanced, as well. The results of orthognathic surgery can have a dramatic and positive effect on many aspects of your life. So make the most of the new you! If you have health insurance, make sure you read your medical and dental insurance policies or check with your insurance representative to determine if your plan will cover orthognathic surgery before you begin treatment. Because orthognathic surgery requires a team approach involving an oral and maxillofacial surgeon and orthodontist, obtain cost estimates from each one prior to treatment. Their fees are your responsibility regardless of how much your insurance may cover. Your oral and maxillofacial surgeon's office has its own financial policies, so be sure to discuss payment arrangements prior to treatment and make sure all parties fully understand these arrangements. Your surgeon, orthodontist and general dentist or their financial coordinators will be happy to answer any questions you have about fees and payment. 1. Swelling is a normal reaction to any surgical procedure, and the amount varies with the individual and the procedure. Swelling will likely increase for approximately 24 to 72 hours following surgery and typically remains unchanged for approximately one week, then usually subsides by the third to fourth week. 2. Nausea and vomiting are complications of general anesthesia but occur infrequently. Because you are on a liquid diet, anything that "comes up" will be liquid and can escape from between and behind your teeth. Medications can be given to control any nausea that might occur. 3. 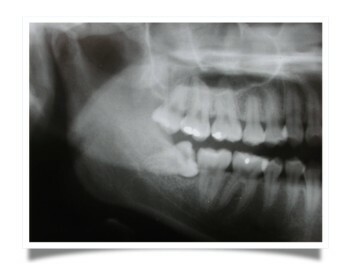 Pain following orthognathic surgery is usually moderate and can be controlled by medication. lf symptoms persist that cannot be relieved by prescribed medication, contact your surgeon. 4. Minor bleeding may be experienced after surgery and if upper jaw surgery has been performed, there may be some oozing of blood from the nose. This bleeding is easily controlled in the hospital setting. In the rare event excessive or prolonged bleeding occurs after you return home, contact your surgeon immediately. 5. Loss or alteration of nerve sensation, resulting in numbness or a tingling sensation in the face, jaw, teeth or tongue may occur as nerve fibers are regenerating and mending. As healing takes place, you may have sensations of warmth and tingling in the affected areas. It is infrequent that these remain longer than six months. However, some individuals may experience permanent altered sensations, particularly in lower jaw operations. 6. Infection is a potential risk following any surgical procedure, and if an infection does occur, it is usually treated with antibiotics. If fever, persistent swelling/pain or pus develops following surgery, contact your surgeon immediately. 7. Sinus complications, such as drainage or pain (sinusitis), may occur in some cases involving surgery of the upper jaw. This may or may not require further treatment, but any symptoms of sinus trouble should be reported to your surgeon. 8. Injuries to adjacent teeth and roots, fillings or bridgework can occur during orthognathic surgery, which may later require appropriate dental treatment. 9. Relapse of the new jaw position or unpredicted shifting of jaw structures is uncommon following orthognathic surgery but can occur. If it does, further treatment may be necessary. 10. Persistent limited range of movement of the jaw or impaired chewing or speech function can occur following orthognathic surgery. Special jaw exercises can usually help to improve this condition. 11. Joint pain or abnormal function happens in rare instances following orthognathic surgery. Surgery may aggravate pre-existing jaw joint problems. lf these conditions persist, further treatment may be necessary. 12. Prolonged recovery or pneumonia are rare, but are potential risks of general anesthesia associated with any procedure, including orthognathic surgery.